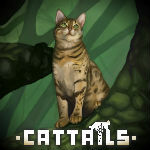 Suggestions for battles | Cattails: Become a Cat! Custom colonies are great but one thing confuses me, why does your cat suddenly have a small army? I think it would make sense to have an npc (or use the guard) who you use to hire cats. When you use the guard to attack somewhere you could select what cats you send (maybe have a limit that you use mews to increase) and if a cat is defeated they can't be used for a few days. Maybe you could use mews to upgrade that cats skills and give it pelts, change its name and give it accessories. Also giving them herbs they could use would also be good like healing herbs, healthy herbs or even poison. I remember in Untold Tales there were enemies that could vanish and some that were just stronger then others. I think having different enemy types would be cool. You could see if an enemy was a special type because instead of just having the name 'Tom' they would be 'Tom the Hunter' or 'Tom the Feral'. The special Enemies wouldn't make up the bulk of an invasion with maybe 1 special enemy per 4 normal enemies. Cats that use stealth to vanish for surprise attacks, abilities like study prey and lions roar would make them unable to hide for a certain amount of time. Ofc they cant be hidden when attacking or being attacked. Cats who have been taught by the colonies healer that have minimal fighting ability but carry healing herbs which they use on allies. Cats whose vicious attacks cause their foes to bleed. Cats who are expert strategist boosts the abilities of all surrounding cats of their colony. When you kill him all the cats loose their boosts. Cats who are large and trained in combat by the Mountain Domains best. They roar causing random debuffs to foes. Cats who hurl pinecones at foes while their allies attack head on. Cats who use snake lilies on their claws to inflict poison damage on foes.